Anyone out there in gramblerland who has read of our fundraising activities in https://www.justgiving.com/Geraldine-Smith3 will have noticed the occasional donation with the words ‘Did a nostalgia presentation’. These events raise funds for the Bobby Moore Fund and are enjoyable little slide-shows where I, basically, just sit there and press buttons on my laptop. The, mainly older, members of the audience appreciate seeing the things/places/styles/people they remember from their younger days. My nostalgia shows are a cheery trip down memory lane. I do, however, introduce the topic by describing an earlier use of the word ‘nostalgia’. In the 19th century nostalgia was not something to be cherished; it was an ailment. A person might be said to be suffering from nostalgia. It was a form of stress triggered by modern life; it was a longing for the times when life was so much more simple. Consider this, the late 18th to early 19th centuries saw the industrial revolution change the world. People were forced to migrate from the open spaces of the countryside, where work was scarce, thanks to the earlier agrarian revolution, to crowded towns and cities where, though work was plentiful, conditions were abysmal. Many mill and factory workers rarely saw daylight in the winter months. Is it any wonder people longed for the olden days? Fast forward a couple of hundred years to the late 20th century. I remember when I worked [You’ve got a good memory. - Ed.] Information technology (IT) was seen as the future. Offices would become paperless we were told. [I’ve been to a few public conveniences like that. - Ed.]. The first move in this direction was computer aided draughting and design. No longer did draughtsmen sit with pencil in hand at a drawing board; all design work was carried out using a computer with a CRT screen as the ‘paper’. Those draughtsmen who were nearing retirement age just couldn’t adjust to this high-tech wizardry, whereas the younger element took to it without any difficulty. Of course, the added advantage from the company’s point of view was that fewer draughtsmen could now carry out the required amount of work. Redundancies were announced fairly soon after this innovation in work practices was implemented and the older guys leapt at the chance to escape this modern trickery. The bosses applauded their business acumen and soon every aspect of office life was changed by the introduction of computers. As before, older employees were completely flummoxed and feared using a computer; they wanted nothing to do with this new-fangled contraption. The bosses must have been rubbing their hands with glee as, again, more work was possible from fewer employees and, as everyone had their own keyboard, bye bye typists in the typing pool. Where is all this leading, I hear you ask. Well, those young guys that were able to embrace the new technology are now the bosses and, because they are adept at using their computers, they assume that everyone can use them. [Your point is caller? - Ed.] My point is that for every transaction that used to be dealt with by speaking to somebody in a bank, post office, travel agent, etc. we are now instructed to go on-line. [And what if you don’t live near a railway? - Ed.] Ahem... Not everyone has access to a computer. I am thinking of those older folk for whom computers are a modern form of witchcraft. How are they supposed to deal with business having to be done on-line? I think it is really unfair of business people to assume that everyone is computer-literate. I reckon there is a lot of nostalgia about these days. Were any famous or notorious people born on the 2nd of February? Of course, here are some I’ve even heard of. Hamnet and Judith Shakespeare 1585 (Twin children of Will. Hamnet only lived til age 11. ), Nell Gwyn 1650 (Charlie the second’s bit of crumpet. ), Frederick Vanderbilt 1856 (Railway magnate. [He was ‘attracted’ to the job! - Ed.] Ahem... Are you on something? ), Solomon Guggenheim 1861 (Him from off of the museum. ), Fritz Kreisler 1875 (Fiddler. Time for our first clip. Here’s a piece you might recognise. ), James Joyce 1882 (Orfer. ), Burton Lane 1912 ([A street? - Ed.] You are definitely on something... Songwriter. He wrote this. All together... On a clear day, rise and look around you. ), Elaine Stritch 1925 (Ectress. ), Stan Getz 1927 (Saxophonist. Another clip? Here’s one you’ll recognise, I am sure... Desafinado. ), Les Dawson 1931 (Comedian. ), Tom Smothers 1937 (A brother. ), Norman Fowler 1938 (Politician. ), Sir David White 1940 (Who? Oh, David Jason. Ectaw. ), Graham Nash 1942 (Musician. Another clip? Indeed. All together now... I'll light the fire. You place the flowers in the vase...), Andrew Davis 1944 (Organist and conductor. Time for a bit of cult’yer. Here’s Andrew with Cortege Academique. ), Farrah Fawcett 1947 (Ectress. She was a Charlie’s Angel. Erm... that’s it. ), Duncan Bannatyne 1949 (Businessman. ), Libby Purves 1950 (Radio presenter. ), Christie Brinkley 1954 (Clothes horse. ), Eva Cassidy 1963 (Singer who died aged just 33. Another clip? Here’s Fields of Gold. ), Shakira 1977 (Singer. Here’s her first hit Whenever, Wherever. Yeah, whatever. ), Barry Ferguson 1978 (Footy bloke.) and Gerard Piqué 1987 (Futbolista tambien.). It was lovely to hear a song written and sung by Graham Nash. We are two fans who have followed him from his days with The Hollies. He wrote a couple of songs which were rejected by The Hollies, but were recorded in his collaboration with David Crosby and Steven Stills. One was Marrakesh Express, but we can’t remember the other. Can you help? Mateusz Klich scored twice as Championship leaders Leeds came from behind to win at Rotherham. Semi Ajayi had given the Millers a half-time lead, firing into the top corner from 20 yards to cap a fine passing move. But Leeds levelled when Klich capitalised on uncertainty in the home defence to stab home from close range. And the Poland international midfielder netted the winner four minutes from time when he slotted in Jack Harrison's cross from 12 yards. Lucas Akins got the breakthrough for Albion after a sluggish first half. Centre-back John Brayford was allowed to run deep into Bradford territory and cross into the middle for Akins, who headed down into the net in stoppage time. Burton goalkeeper Brad Collins had to be alert to make an excellent save from Eoin Doyle after David Ball had done well on the right. Bradford thought they had scored when Jack Payne headed in after Collins had saved well from Hope Akpan's curling effort only for an assistant's flag to deny him. But Akpan was not to be denied in the 68th minute when he lashed home a loose ball in the box after Albion struggled to clear a corner. The first half saw few chances at either end, but Stags took the lead after 22 minutes when Jorge Grant punished Steve McNulty's foul on Tyler Walker on the edge of the box with a superb curling free-kick into the top left corner. Banks then saw red after being booked in the 32nd and 37th minutes, but the visitors almost equalised in added time when James Norwood headed over from a corner. Mansfield netted the all-important second goal 20 minutes into the second half as Walker tucked away a follow-up after Rovers goalkeeper Scott Davies had blocked a powerful 25-yard shot from Nicky Ajose. Three minutes later Davies kept out a swerving Walker shot but again was helpless as Grant was on hand to slot home the rebound. Keshi Anderson's 90th-minute penalty miss cost Swindon a point as Filipe Morais' first-half effort earned Crawley a 1-0 win. A first half with barely any goalmouth action to speak of concluded with Morais finding the back of the net with a shot from close range that deflected first off Tom Broadbent, and then Luke Woolfenden, before bouncing slowly into the net. In the 89th minute, Canice Carroll was fouled in the area and Swindon had the chance to grab a point, but Anderson's spot-kick was well saved by Glenn Morris as injury time began. Woo hoo! Mon the ’Well! David Turnbull's fantastic spot kick was enough to give the Mighty ’Well all three points. Ryan Inniss' rash challenge brought super sub Elliott Frear crashing to the turf in the box for terrific Turnbull to convert on 60 minutes. Yay! Andy Nelson and Rory Deacon both went close for the hosts (Boo! ), but they couldn’t breach the magnificent Motherwell defence. A brilliant day’s work for the Steelmen. Match reports supplied by Press Association. Okay... Some match reports supplied by Press Association. Woo hoo! That’s the whoppingest total we’ve had in a long time. Who knows, this could be the week The Grambler has it spot on. [Ooh look! A flying pig. - Ed.] I’m convinced you are on something. Teaser time. Yay! Last week I asked you which player became the first ever to win all three trophies available to an outfield player at a World Cup finals. The answer was Manuel Francisco dos Santos, known as Garrincha, who won player of the tournament, leading goalscorer and, of course, a cup winner’s medal. He won 50 caps playing for Brazil. The only game Brazil lost when he was in the team, was Garrincha’s last game when they were beaten by Hungary in the 1966 World Cup. He was a brilliant footballer, but his private life was a disaster. He drank heavily throughout his adult years and his two marriages were unhappy and he had several affairs. He is known to have fathered 14 children at least. He died of cirrhosis of the liver aged just 49. Ooh, I need cheering up after that. Let’s have a teaser for this week. Which premiershit goalkeeper was named footballer of the year for six consecutive years in his homeland? Too easy? Maybe. Try it out down the pub. And finally Cyril? And finally, Esther, it is a sad end to this week’s edition. 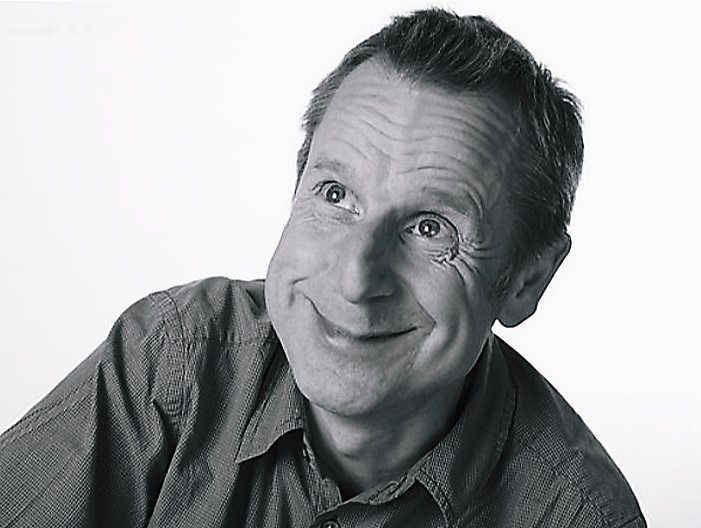 As I write this, I have only just heard of the death of one of my favourite comedians, Jeremy Hardy. He was just 57. I have followed his career right from his earliest TV appearances. Who else remembers him as Jeremy the trainee in 1986? I went to see him on stage about 30 years ago. I listened to his radio series At Home with the Hardys and Jeremy Hardy Speaks to the Nation. He seemed to be most at home on radio panel shows. The News Quiz was always improved when he was involved. His performances on I’m Sorry I Haven’t a Clue are legendary... especially when singing was involved.